This project is to design and develop a historical document analysis system as a computer assistant for musicologists and historians to help them in their work in studying early western musical manuscripts. Further we intend to use the resulting system to explore open questions in historical musicology. The guiding premise is to construct a system that experts in the field of musicology can use to study the subject documents and explore research hypotheses without requiring advanced computer science expertise. For this reason, features and interfaces of the system are being designed in close cooperation between computer scientists and research musicologists. From a computer science perspective, the system will include the latest technology in historical document analysis, such as specialised noise reduction, binarisation, layout analysis, feature extraction and symbol recognition, word spotting and more. Statistical tools for clustering and classification will also be provided. For the present project, it is important not only to use notation which has been well-studied, but that the book in which it is found is familiar to many musicologists. For this reason, we have chosen to focus on the liturgical Office book St. Gallen Stiftbibliothek, Cod. Sang. 390 / 391, sometimes referred to as “Hartker’s Antiphoner”, since tradition has it that a recluse monk named Hartker completed this book at St. Gall sometime around the turn of the 10th century. A facsimile of this antiphoner was published in 1970 Jacques Forger ed., Antiphonaire de Hartker, Paléographie musicale II, 1 (Bern, 1970): 67–86.. More recently, the abbey library at St. Gall joined the Swiss project entitled “e-codices” which makes digitized JPG images of many valuable books in Swiss libraries available for free on the internet. Hartker’s Antiphoner is now accessible online, as part of this initiative. Hartker’s Antiphoner was recently the subject of a detailed palaeographic study which found that there are actually at least five hands represented in the manuscript Kees Pouderoijen and Ike de Loos, Wer ist Hartker? Die Entstehung des Hartkerischen Antiphonars, Beiträge zur Gregorianik 47 (2009).. This number was determined by manually inspecting the forms of each neume and comparing one to another. One goal of this project is to use a comparatively objective method to confirm or refute the conclusions of this study. 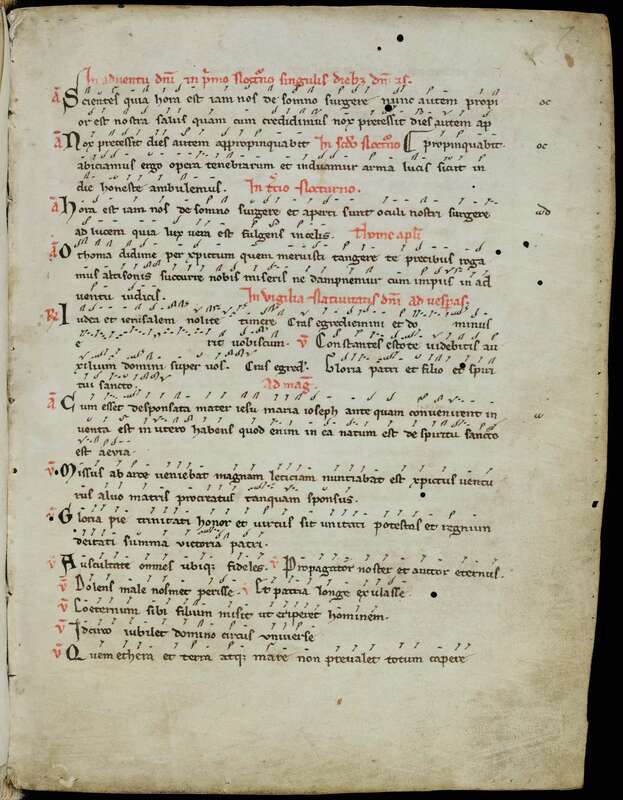 The following is a reduced resolution sample page from Hartker’s Antiphoner: St. Gallen, Stiftsbibliothek, Cod. Sang. 390, p. 7 (http://www.cesg.unifr.ch). The full resolution image for this page can be found at http://www.e-codices.unifr.ch/en/csg/0390/7/x-large.